Since He openly stepped into my life four years ago, communication between Mercury and me has often taken the form of moments of luck. This may come across as odd for those of you not in a polytheistic mindset and yes, this is highly subjective. But it adds up, in that in times of doubt, decision or mercurial significance, things have happened: I find money on the floor in public spaces, I win small lottery prizes, I loose things and find others shortly after. And while I treasure every single one of those moments, this form of communication has nonetheless its limitations and allows for little more than a “yes”, “no” or “heads up”. So I need a divination method that’s practical, easy to use for a non-spirit worker like me and rich enough to allow for a more complex “dialogue” with Mercury. So I did some research, looked at what others are doing, mind stormed a bit and came up with something new that’s based on the historical sortes, a form of bibliomancy where sentences from Homer or Virgil were “randomly” picked, but also owes a great deal to Sannion’s Oracle of the Doors. I called it the Postal Oracle, which is both a tribute to the god of messengers and a reference to the source of the material: Going Postal by Terry Pratchett (may he be honoured and feast with his ancestors!). The choice of book is not without mercurial significance, for a trickster is essentially a transgressor and there’s something subversive in sortes taken not from classical authors so often placed on a pedestal, but from modern satirical fiction about a con-man who escapes death and is placed in charge of a decrepit postal service he cunningly manages to revive. It’s witty, funny and a tribute to man’s resourcefulness and ability to act smart, even if not in an honest manner. And the postmaster wears a golden suit with a winged cap – an avatar of a god, one of the characters says. It’s all well within Mercury’s realm. Of course, I wanted to make sure He was on board with this, so almost a year ago I offered Him incense, explained Him the whole idea and asked for a sign of approval, should He agree and be willing to guide me through the selection of the sentences. A few days later, things happened: I got a small prize out of a lottery ticket and my mother lost a two euro coin, which turned out to be at home, right next to Pratchett’s book, which I was keeping close to Mercury’s shrine. And it wasn’t just any coin: it was an Italian two Euro coin, which has Dante’s laurel-crowned head on it. An acclaimed writer, in other words, which I took as a sign of approval of the source material. Several days later, I also had dreams that involved coloured stars and dice. Now, my initial thought was to use bibliomancy to pick the sentences, but that didn’t turn out well. I hesitate too much and after several dozen picks, creasing starts having a say on which pages you open. 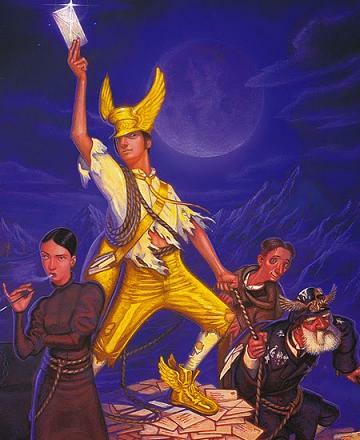 As I struggled with this, I had a dream that involved a Terry Pratchett title and book cover: the words were Carpe Jugulum, but the image was from Maskerade. I wondered if this meant I should take a look at those two books, but then it occurred to me that the mismatch between title and cover could mean that I shouldn’t combine the two. Rather, I thought, it may well mean that I should stay within Pratchett’s universe, but seize the throat, i.e. pick the words myself. Which is what I did and, several months later, when I finished going through Going Postal, I did the math and found out I had unintentionally written down 444 sentences. Message received! Another issue I had to solve was the type and number of dice. Early on, I decided I wanted them to have different colours, for dice don’t normally come out in a straight line, so I need a way of knowing which one stands for the units, dozens and hundreds. My initial idea was to use four six-sided dice, which meant I would have to list 1296 sentences, but since I had only 444 when I finished going through the book, I knew I needed to rethink that. The solution presented itself shortly after: keep things as much as possible in multiples of 4. It was obvious, but I missed it in the middle of all the mind storming. So I’ll be using four eight-sided dices, three of which will have numbers from 1 to 8, allowing for a total of 512 answers (5+2+1=8). The fourth dice will be different and should have two symbols four times: one will mean that the god has nothing else to say and the other that I should draw again to add more sentences to the reply. That way I won’t have to rely on pure instinct to decide whether to throw the dice again and Mercury can talk all He wants (and rumour has it that He can be very chatty). The colours will be those I dreamed of: red for the units, blue for the dozens, green for the hundreds an white for the more/enough. Starting tomorrow and then on the first Wednesday of every month, I’ll be using the Postal Oracle to seek advice or divine what will happen during the month. I’ll be writing everything down and analyse it as an experiment for at least a year, so as to see if the system works as it is, if it needs a few changes and if Mercury’s approves the final version. Putting it all together has led me to conclude that divination is a matter of shared language: you give the Gods enough vocabulary they can work with and they’ll use it to the best of its ability and according to their will. And just as with any language, both sides need to understand it and know how to use it, which requires practice. So I’ll be practising and I’ll be open to suggestions from Mercury. I reckon this is going to be an interesting ride. I’ve been under posting severely, but I haven’t had enough free time to properly write posts. Still, when I reach a certain number followers, I feel an obligation to post regularly, so as a way of breaking my blogging fast and keeping things going, here’s some catching up. These last few weeks have been very busy with seemingly endless writing about Vikings, medieval texts and Norse mythology, though for work reasons and not related to practicing polytheism. But I’ve going so deep into Scandinavian topics and sources that I started wearing my old Thor’s hammer again. To be honest, I’ve been keeping it in my pocket since last October and when I couldn’t find a good replacement for my broken caduceus pendant, I went back to the little hammer I bought in Sweden almost ten years ago. Surprisingly, I feel perfectly comfortable with it. I expected a sense of displacement, as if I was wearing something that no longer reflected who I am, but no. It feels fine; at some points, it even feels right. Perhaps because religiously I’m still half Norse and professionally I’m focused on medieval Scandinavia, so I guess a Thor’s hammer bought when I made my Masters in Uppsala is appropriate. And also I love a good thunderstorm. Yet I acknowledge that it’s the symbol of the Red Bearded Thunderer, so I’ll be adding libations to Thor on the Ides of every month, when I also honour Jupiter. No intent of syncretising Them, though: as with Frey and His family, I’m Latinizing, in this case by allowing Roman praxis to determine when I honour a Norse god. I’ve also been working on a long poem dedicated to Ingui, which should be partly devotional, partly ritual and bit narrative too. Basically, I want it to be a poetic summary of His Latin cult, but there’s still a lot of stanzas waiting to be written and I need to perform divination in order to get Frey’s approval on several things. To that end, I brought back something I haven’t used since my long gone days as a Wiccan: a tarot deck! Back then, I bought the Sacred Circle Tarot, which I haven’t used in over a decade, but since I’m not particularly in tune with runes and I need a tool that allows me to contact Frey when there’s need of it, I decided to try using something I already have at home. Ergo, enter the fourth suit of the minor arcana, which works with earth symbolism. It seems appropriate to Him, especially given that the King of Discs sits on a throne with boar heads. Time will tell if it works or not. If it doesn’t, I’ll just have to create a divination system from scratch, which I’m also doing anyway, but for use at the end large ceremonies. This follows the common practice in the ancient world, when lots were drawn or signs looked for in order to determine if the sacrifices had been well received by the Gods. Which is why I want a simpler system than tarot cards for that end, so I’ll be using chest or hazelnuts and enjoy the pun of consulting Ingui’s nuts to know if He enjoyed it. Enjoyed the sacrifice, that is. Other than that, it’s been mostly regular offerings and ceremonies. On my birthday, I performed a long one with an extensive opening where I honoured ten deities, plus my ancestors, all before the main focus of the ceremony, which was my genius and my penates. Having been born at home, I feel like my house wights are a sort of personal spirits too, so I placed a wreath around Their images. I also ran 10 kilometres in 39 minutes on May 18th as a tribute to Mercury, taking advantage of a local race so close to Mercuralia. And I’m getting into the habit of making small sand ships by the ocean and then pour wheat in them as an offering to Njord. It just feels great after a good sunny afternoon on the beach, coupled with an offering of honey to Ingui-Frey every Sunday morning. That and throwing a coin into the air and let it fall wherever it may as a tribute to Mercury before I head back home on my bike. And as I pedal, as I go through fields and pass next to wooded hills, I may see kingfishers, hawks, crows or herons flying next or over me. Honouring the Gods through our everyday pleasures and smiles feels great!